There’s a little inside joke within our hobby that complains about the over-abundance of “trading in the Mediterranean” games. To be fair to old Mare Nostrum, it also applies to Medieval Europe, trains, planes, and boats, etc. Of course, it’s a stereotype exaggerated for humor. Nevertheless, shipping and trading have been and continue to be very popular and common themes. Did this mechanic start it all? Well, that’s probably hard to confirm one way or the other. But I’m certain it has fanned the flames! Pick-Up and Deliver: How Does it Work? At the risk of sounding condescending, this is one of the more self-explanatory mechanics in the hobby. 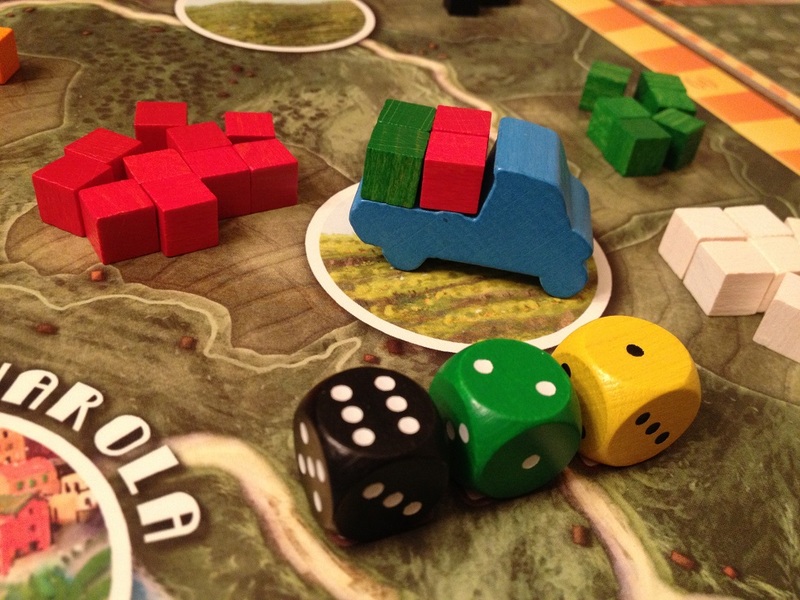 Basically, the pick-up and deliver genre involves traveling to a physical location on a game board, picking up a resource or object, and then moving to another, usually specific, place to deliver it. Generally, the player then receives some benefit for his/her efforts. However, as simple as it sounds, there can also be much more depth to it, as well. In some titles, the pick-up and deliver component really serves as the game’s overall driving identity, purpose or goal, in a manner that broader design frameworks like tableau-buildingor deck-buildingalso provide. Then again in other cases, it is only one part of many elements and becomes more of an individual mechanic in the way that, for example, action point allowance or role selection are more about providing particular means to reach an end. Indeed, in either case, the genre is always paired with one or more other mechanics by which to achieve the actual picking up and delivering. Typically, the game begins with some or most of the resources that are being taken already on the board, either by pre-determined set-up or random seeding. The target destination, or “demand,” for those items can then also be pre-determined or random – and may even fluctuate during the game. Furthermore, many titles in this genre provide goals for delivering certain things to specific places. These objectives can be available for all players to fulfill, or assigned individually. There are a few seemingly obvious characteristics to nonetheless note in further defining this category. First, the gaming environment is communal and resources are equally accessible to all players, even though each may still have independent goals to meet certain deliveries. Second, movement in a given turn is influenced by movements from previous turns. There are both spatial and/or geographic restrictions, plus action mechanics, that limit the distances or places traveled each round. Third, it is important to emphasize both parts to the pick-up and deliver equation. Some games labeled on the Board Game Geek database under this mechanic actually involve just picking up or just delivering. You might start with an object to deliver somewhere, but this omits the preparatory movement in order to gather the resource in the first place. The first such listing is Mancala and its variants – which I’m assuming the given date of 500 is really more of a guess – and falls loosely under this consideration. In Mancala-style games, there are no spatial restrictions to picking-up seeds. Furthermore, the delivery mechanic itself is too programmed and formulaic. Other than the sense of physically grabbing pieces and dropping them in cups, its not really a pick-up and deliver game. More commonly, some designs abstract the delivery concept in that the item nebulously goes “somewhere” after collecting it, which makes it simply more of a prize, rather than something in demand to be taken to a specific location. Robbing the Miller (1888) is the first modern pick-up and deliver title to be categorized as such, but falls into this abstraction. The exercise is more concerned with stealing other players’ grain and getting it back “home,” as opposed to carrying it to a particular place. More recent games along this line might be something like a dungeon-crawl or adventure game where you can pick up treasure, but that’s all. “10-40, Good Buddy” – trucking loads overland in The Great Heartland Hauling Co.
Cargoes (1933) is really the earliest title which would exhibit the prime elements of pick-up and deliver, albeit with the now out-dated, roll-and-move mechanic. It was also an early use of the shipping/trading theme, which would soon be commonplace in the genre – admittedly a natural fit. Players represent a country and are given consignment cards which serve as goods. Certain ports around the world map demand different goods and players try to deliver their consignments to those cities, exchanging them for native goods and returning to their home countries. Scores are based on the value of goods exchanged less the amount of unfulfilled consignment cards. 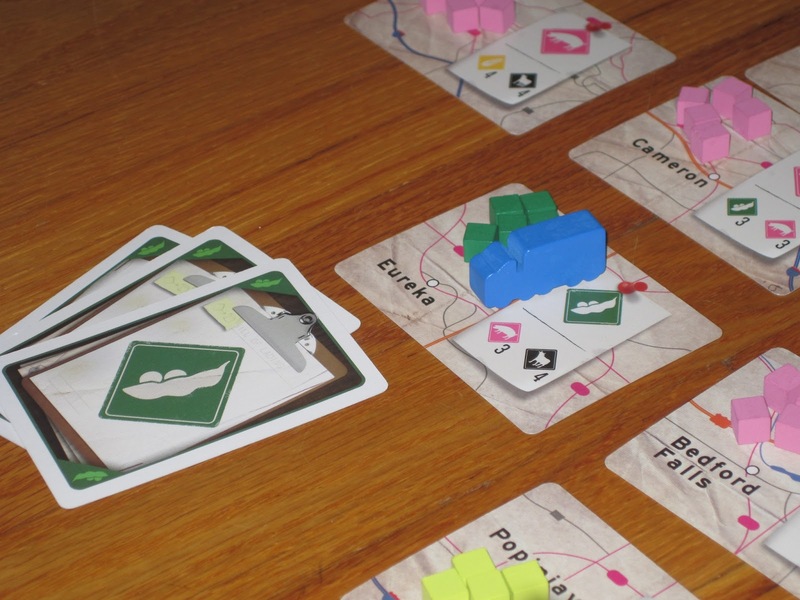 The railroad theme is another staple in, and logical implementation for, the pick-up and deliver mechanic. Usually, these titles include economic elements, route building, development, and/or stock ownership, as well. Perhaps the earliest influence for this style was Empire Builder (1980). This was the first of the crayon rails family of games where you actually draw routes with crayon and then move a train along to pick-up and deliver cargo based on contracts as determined by card draw. Martin Wallace’s triumvirate Age of Steam (2002), Railways of the World (2005), and Steam (2009) are heavyweights in the style ranked # 2, #3, and #1 respectively. They use tile placement for route building, an action point allowance system, and include varying degrees of building and developing elements. The trio abstracts the physical pick-up slightly to tie it in with the route building, and delivery is based on a specific supply/demand system. Besides shipping and railroads, many other themes have utilized pick-up and delivery. Auf Achse (1987) deals with over-the-road trucking. Star Trader (1987) was one of the first to send the genre into outer space. Fire & Axe (2004) goes pillaging and delivering during the Viking Era. 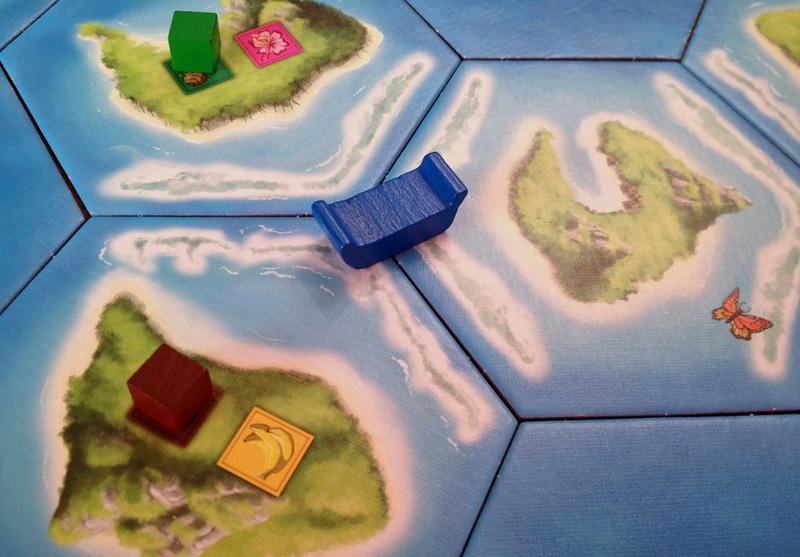 Merchants and Marauders (2010) takes players into the Age of Piracy. Recent titles have even taken the style and gone steampunk, as in Kings of Air and Steam (2013). And of course, simple trading is a ubiquitous theme seen in a variety of places such as Samarkand(1980), Himalaya (2002), and Zanzibar(2007) to name but just a few. One common characteristic to pick-up and delivery titles is the “buy low, sell high” model. Probably the most frequent benefit to delivering goods and fulfilling contracts is earning money. Seven Seas: A Game of Trade (1960) was one of the earliest attempts to simulate this core economic principal. Merchants of the Middle Ages (1999) is another straight-forward example. Pure pick-up and deliver designs may often feel “samey” (see below), so it is quite common to blend it in with other mechanics. This is nothing new to gaming. Genoa (2001) forces players to negotiate with each other and cooperate at certain times to meet demands. Container (2007) has some interesting player interactivity, including bidding and a supply/demand model based on buying cargo from other players’ ports to deliver elsewhere. The pick-up and deliver element in Giants (2008) has nothing to do with trade, but rather collecting and moving giant stones to create the famous head statues ala Easter Island. Merkator (2010) is a deeper game that includes a time element that influences pick-up and delivery, plus it allows you to keep fulfilled contracts to use again, which is rare. And Tahiti (2012) is a good example of how the genre often uses action point allowance; plus it has an interesting twist in that the actions you can take depends on the amount of crops you have picked up. The very accessible gateway pick-up and deliver, Cinque Terre. From a design perspective, the pick-up and deliver genre synergizes easily with other mechanics like action point allowance, role selection, or bidding. All of these sub-mechanics are well-suited toward providing the means by which items are physically collected and carried. Additionally, the style naturally accommodates economic, trading, and railroad themes which have proven popular in the hobby. Probably the greatest appeal to pick-up and deliver games is the opportunity for planning out the most efficient play. There is always the reward of buying low and selling high inherent to the more economic titles in the genre. But beyond that, there is a great sense of satisfaction achieved when meeting the best demands or fulfilling the most lucrative contracts for the greatest benefits. All of which usually requires forethought of planning, flexibility in adjusting to surprises, and patience to stick with your strategy when necessary. In other words, it can be nice mental stimulation. Another benefit to this category of game is that players can usually judge their progress easily. Mostly, you will you have a good sense of your individual development; but many times you’re able to quickly compare that in relation to that of your opponents, as well. However, unless absolutely everything is marked on a victory point track, there is still some unknown information – especially with secret fulfillment orders – so that some tension and mystery remains. This is a nice advantage particularly for new gamers who can get frustrated quickly when not provided with a stick by which to measure their progress. …despite the competitive aspect, pick-up and deliver games prove fairly solitary in nature. In the majority of examples in this style, players are going about their own business paying only mild attention to what others are doing. For those that enjoy more interaction, the mere race for goods or contracts will not be stimulating enough. The words “cube pushing” get bandied about in the hobby and refer to the fiddly handling of numerous game components. That term certainly applies here. You must physically with your little (or big) fingers pick-up the various cubes, tokens, or other bits representing the game’s resources. The more pieces included, the more frustrating this exercise will prove. The biggest drawback to pick-up and deliver is simply the repetition. The recurrent cycle of move, pick-up, move again, and deliver can certainly get monotonous after a while. Taken too a lengthy extreme, it will make the game boring. The best way to counter this problem is to either keep the overall play time short, so that it does not overstay its welcome, or fold in a number of other mechanics for variety. Rowing from island to island to collect food in Tahiti. Auf Achse won the Spiel des Jahres in 1987 and received a reprint in 2007. Themed to over-the-road trucking, this is a classic, pick-up and deliver title with all of the hallmarks of the genre. Merchant of Venus is a 1988 cult classic, just reprinted in 2012, taking the genre into our solar system. In addition to the usual pick-up and deliver elements, players can build better ships and equip them for more effective trade, develop factories for better commodities, and construct space ports to exact tolls from opponents. It also has a fun, dynamic supply/demand model. Serenissima, in some ways, is the Merchant of Venus set in the Mediterranean. While simple to learn, it has a lot of depth and strategy. There are well-integrated building and development components, good trading mechanics, and some rare direct interaction in attacking your opponents’ ships! Railways of the World is the third highest rated pick-up and deliver game on BGG ranked #44 overall. 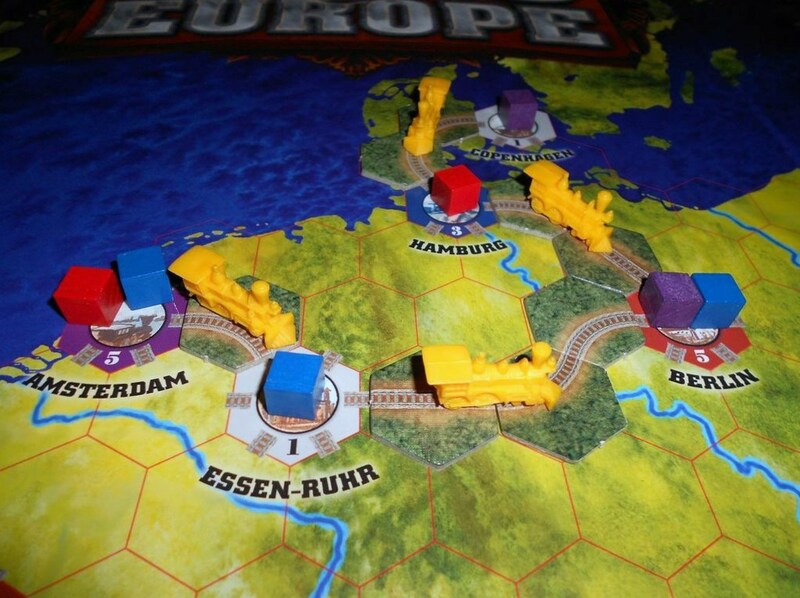 It, and its many spin-offs, are standard examples of the style, using an action point allowance system, some basic building and developing elements, but eschewing the complicated economic workings of other railroad games. It is closely related to the #1 and #2 ranked pick-up and deliver games from the same designer, Steam (2009) and Age of Steam (2002), both with many of their own spin-offs and expansions. Bombay is a pure, straight-forward, no-frills pick-up and deliver game friendly for the whole family and a clean introduction to the style. Perry Rhodan: The Cosmic League is recommended for it uniqueness in that it is a two-player only game from German publisher Kosmos, famous for their two-player titles. Cinque Terre is one of the better “gateway” games in the pick-up and deliver group. Colorful, simple, and fast, this title is great to introduce new people to the style. Here’s a brief timeline of titles using pick-up and deliver. This is by no means a comprehensive list, merely a representation of some popular, unique and/or significant games utilizing the mechanic. What do you think about the pick-up and deliver mechanic? Do you have other thoughts about its benefits or drawbacks? Perhaps you have a favorite title that’s not on our recommend list or the timeline? I’ll admit it: pick-up-and-deliver games are often tedious exercises to me. Which of these games is the most exciting? Hmmm…exciting? Well, that would depend on how thematic and trashy you like it. Fire and Axe for vikings? Merchants and Marauders for pirates? Personally, I can’t wait to play Kings of Air and Steam – I like me some steampunk! I actually really like Empire Builder, as long as it is, and it’s set of games. It really should be included in this list.